The ReoAmbulator™ allows therapists to design patient-specific exercises that work towards improving patient balance, ambulation, coordination, stamina and posture through an intensive, repetitive re-training of normal movement of the entire leg – the hip, knee and ankle – as well as the pelvis, in order to reproduce reciprocal, synchronized natural gait pattern. Who can use the ReoAmbulator™? The ReoAmbulator™ provides innovative and adaptive therapy based on advanced measurement capabilities and closed loop feedback control. Throughout the treatment, patients are continuously engaged in Virtual Reality environments, taking on motor and cognitive challenges for the upper limbs, all while receiving instant audio and visual feedback. They are monitored during the entire session in order to evaluate their achievements while the program adapts accordingly. 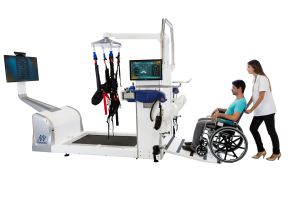 The ReoAmbulator™ has been implemented in various rehabilitation centers and successfully passed clinical and technical evaluations with various patents in multiple locations in Europe, Asia and Israel. The ReoAmbulator™ incorporates advanced management software that provides the therapist with comprehensive data, allowing for real-time adjustments and modifications to therapy, as well as recording and reporting functions. The ergonomic design of the ReoAmbulator™ allows the system to be set up quickly, in less than ten minutes, and readily adapted to each individual patient. Versatile, user-friendly therapy management software gives therapists full control of the session and the ability to determine the training module (Multitasking or Gait Analysis) and the mode of operation (passive to various adaptive active modes), which leads to improved ambulatory outcomes. Advanced ergonomic design, which includes quick harnessing of the patient and computerized control of robotic leg height and lifting hoist for patient’s body weight support, leads to a short set-up time. The ReoAmbulator™ system offers each patient greater engagement in their own therapy through a Virtual Reality environment geared towards optimizing therapy sessions and improving outcomes. Main screen size: 40 in. HD TV; therapist touch screen size: 22 in. After years of research, we now know that the central nervous system is constantly able to remodel itself throughout a person’s lifetime. This neuroplasticity, as it’s called, is a normal function of learning, and also a normal function of brain recovery after damage, and is dependent on the practice of the right kind of activities. The ReoAmbulator is a way to introduce as normal a movement as we can, to a damaged nervous system or body, so the patient can practice walking as normally as possible. These repetitive events can cause the nervous system to adapt, effectively, re-learning a motor skill. We’ve seen people get to walking earlier than they may have if they had followed the traditional therapy route. In addition, many others are noticing improvement in their walking abilities after adding ReoAmbulator training to their outpatient rehabilitation therapy. Adding this training to a therapy program, even at a later stage of recovery, may help all sorts of patients with central nervous system disorders, such as stroke, traumatic brain injury, multiple sclerosis, spinal cord injury, and perhaps even developmental disorders, such as cerebral palsy.